Sometimes she's called Bubbles. Other times she's called Tiny or Peanut or Dumbo. But she's known mostly as Nosey, and she's quite possibly the saddest circus elephant in America. Karen Ess, of the activist group Action for Nosey Now, worries that nothing is changing for her anytime soon. "After seeing Nosey in person several times early in the year, the rate at which her condition has worsened is shocking," Ess told The Dodo. "For at least the last couple of engagements, Nosey has been exhibited at no charge to the venue host, leaving more, if not most, of the responsibility to generate revenues on Nosey's back - literally," Ess said. This means that Nosey has to give enough painful rides to support the business and travel expenses involved in carting her from town to town, according to Ess. At a recent gig at a strawberry festival in Lagro, Indiana, a Nosey advocate named Keri Fields shot some video of Nosey - and glimpses of Nosey's plight are harder and harder to come by. Nosey's travels this year began in Kissimmee, Florida, at a petting zoo behind the Gator Motel. 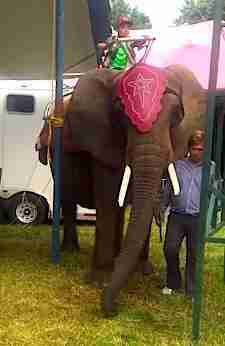 "Since Kissimmee in April, Nosey has been kept behind the shrouds of tents or makeshift tarp walls for exhibitions," Ess said. "Photography is strictly controlled. Why, if there is nothing to hide, would anyone go to such great lengths to keep Nosey from public view?" In the latest video, Nosey's left rear leg alternates between dragging and a rigid, awkward sideways swing, Ess observed. "It doesn't take a vet to recognize how contorted Nosey's gait has become," she said. Taken from her mother in the wild at just 2 years old, and shipped from Africa to the U.S. in the early 1980s, Nosey has been used by people for profit ever since. (Her family was likely killed during her kidnapping.) Even though Nosey, like many performing elephants, suffers from a kind of arthritis called degenerative joint disease, not to mention many other health problems, Nosey's been granted no rest from her performances. She also hasn't met another elephant in three decades. But there are many people out there who have been trying to help Nosey. The Elephant Sanctuary in Tennessee offered to take in the downtrodden elephant, but Liebel has refused to give her up. Despite countless petitions and efforts to shed light on Nosey's suffering, the USDA (which regulates captive animals like Nosey) has failed over and over to rescue the exhausted elephant. Earlier this year, the USDA renewed (yet again) Liebel's license for owning Nosey. So, this traveling season - the warm summer months when towns hold festivals and when Liebel can cart Nosey from town to town in a truck, making profits off of her - is shaping up to be like all the others. "Quite frankly, I don't know how Nosey will be able to get through a full season considering the clearly painful condition she is enduring," Ess said. 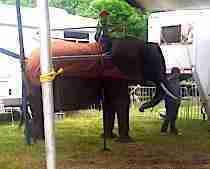 Urge Congress to take action for Nosey now.